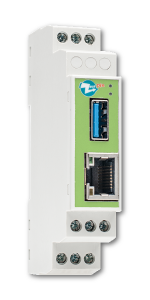 Zeus Din PV is equipped with 2 different types of interfaces in order to communicate: it is equipped with one USB and one Ethernet. The USB mass storage interface allows implementation of the basic configurations and the download the data stored for analysis off-line with dedicated software, while the Ethernet interface allows using the integrated Web Server to configure the device and to monitor the electrical variables in real time mode and it's possible to verify in a timely manner any actions taken on the electrical system. Zeus Din PV is designed to be installed on DIN rail, inside electrical control panels. Its extreme compactness, equal to one Din module, make it extremely versatile and able to be used in any electrical panel which present confined spaces. The electrical wiring needs are the connection of the power supply, as well as the installation of two CTs (current transformers supplied ) for the current measurements.